The man stood shifting his weight as he detailed the events of his sighting. Every so often he would raise his foot and rest it on the edge of the bar, all the while scratching his stomach nervously. “Scales?” said the fellow standing next to him. He raised his eyebrows with intrigue, yet he made no eye contact with the man. “Weren’t no dolphin,” protested the man, his eyes growing larger and more pensive by the second. “Quick like that!” he said as he snapped his large round fingers in the fellow’s face. “Dern these cats!” he murmured under his breath. “I’ll skin every last one uya!” he shouted holding out a small knife no sharper than a comb. 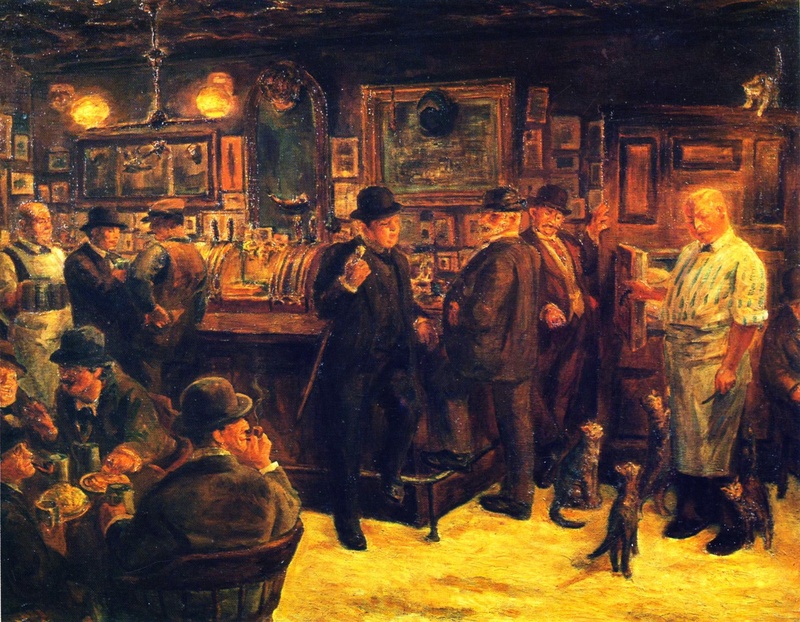 There were several cats crowding around the barkeeper, each one of them almost identical to the other. One walked in circles, making a point to rub its neck up against the barkeeper’s leg each time it came near him, another sat with its front legs in front of it and fixed its hungry eyes on him, another climbed his leg, hopping up higher and higher with its claws out, and another still had found its way up onto a large cabinet beside the bar. “Now what are you two goons yammering about?” said the barkeeper, or Mac as the fellow had called him. It wasn’t a question at all, yet he delivered it that way, almost in a pandering sort of fashion. “What creature?” cried Mac. “Aghh!” he shouted as the leaping cat dug its claws into his leg. He kicked at it angrily, but clearly made no intention to actually harm it. “Mythological, you mean?” corrected the fellow rhetorically. “I thought you said you only caught a glimpse of it,” smirked the fellow. “That’s the beast,” agreed the man pointing his finger again. Just as he was speaking, the cat that had been on top of the cabinet leaped down onto his shoulder, locking its claws and quivering. “Of all the…” shouted Mac as he spun in circles and swiped the cat off his shoulder. “Won’t get the chance,” said the man firmly as he turned his eyes away for the first time.